Namco Bandai’s tactics RPG cavalcade of cross-company characters is exclusive to a Nintendo handheld, so how about some Nintendo-owned heroes? 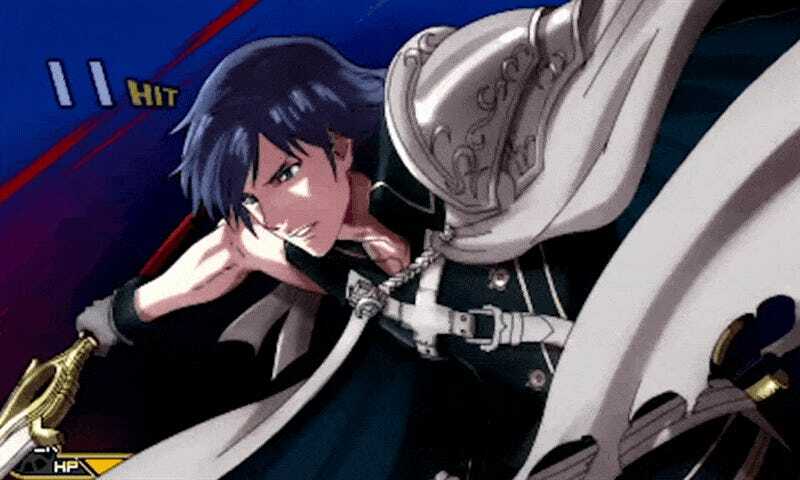 Fire Emblem: Awakening’s Chrom and Lucina are a great start, and they’ve picked a perfect partner for Xenosaga’s KOS-MOS. Namco Bandai promised new character announcements for Project X Zone 2 when Richard Eisenbeis played the game earlier this week. Now we have a lovely trailer featuring featuing Awakening’s blue-haired heroes and the lovely Fiora from Xenoblade Chronicles as KOS-MOS’ dance partner. For those unfamiliar with the Project X Zone series, it’s pretty much “What If X and Y Were In The Same Video Game: The Video Game.” Characters from across several different prominent Japanese publishers—Capcom, Bandai Namco, Sega and now Nintendo—join together for who cares, it’s awesome. Movement is tactical RPG, battle switches to a side view, where players mash buttons until an awesome anime cutscene plays. I am not even kidding. The first game remains one of my all-time favorite 3DS games. The second, featuring the folks we just discussed, arrives on Japanese 3DS systems in November, North American ones on February 16.